Gambles, especially foolish, futile ones, always steal a part of my heart. Gloriously autumn day, the first really brilliant day of color in glassland today, so I flipped up the garage door and set to work. Or tried to. The first spiders of fall slowed me down quite a bit. Even among spiders–the natural mathematicians of the invertebrate world–the golden orbs are something special. Not only are the spiders themselves beautiful, all red-orange, gold, brown and black, but their webs are immaculate geometric visualizations. Theirs are the storybook webs of Halloween, spun between posts and trees and walls and rocks…and sometimes cars. There are three that live right by the garage door, huge females ripe with eggs, grand old dames weaving the last few webs before the end. They’re capturing those weird stinkbuggy things, wrapping them carefully in silk and storing them away. The webs sway in the breeze, tracking every movement with all the precision of a sci-viz program, and I can follow the eddies and currents of the air simply by watching it ripple across the stairstepped silk. There’s a perfect web in the corner of the garage door, magnificently crafted, connected at alternating points across the doorframe. It reminds me of the web wireframe scenes in the movie Coraline, right down to the hole in the center where a golden orb usually waits. There’s no spider in this one, though, and the web hangs, beautifully forlorn and unused. I’m wondering if the owner was picked off by a bird when I notice a small silk tracery spanning the distance from the garage door to the front bumper of my car. I follow it carefully with my eyes and there, barely visible, sits the spider in another perfect web. She’s an Olympic-class webspinner, alright–the webs stretch at least five feet across to the car. Since I drove in last night at about 10pm, she’s done this in one short night. The webs attach to the corner of the bumper, travel to the rim of the headlight, and back to the garage again. They’re stunning, precisely sectioned, spun of silk so fine I can only see them at certain angles and can’t photograph them. (I tried) They stretch tautly across the space, moving a bit in the breeze that springs up…and the golden orb tenses and rides the wind. She’s not as big as her sisters who’ve planted their webs in safer spots, although her webs are about three times bigger. She hasn’t caught anything (that I can see), but maybe that wasn’t the point. Maybe this spider is an overachiever, one of those Guinness Book types who just has to prove it can be done. I set to work on my molds, keeping an eye on the spider, and she quickly swings from headlight to license plate with another web. In a couple of hours she’s managed to capture half the bumper of a large sedan. I think if I gave her another three or four days I’d come out to find my car wrapped in silk, just like one of those stinkbuggy things. It’s tempting to see if she’d really do it, and in any case, I hate to break her heart, but I’m out of aluminum hydrate and EPK. I have six more molds to make before I can call it a day; I need to get to Georgie’s, and I’m not about to call a cab just to avoid inconveniencing this spider. Still, I shower slowly, do a few phone calls, and give her as much time with her prize as I can. Then I can’t wait any longer. I start the car, backing up fast to break the web cleanly and swiftly. I think about her while they’re ringing up my sacks of powder and goo, and on the drive home I wonder if maybe I should have gently removed her from the webs first and set her back on the house. Or the ground. Or anyplace but a driveway with big, rolling tires ready to crunch really foolish risk-takers. Nonetheless, my anthropomorphizing has done its usual headjob guilt-trip, and I park at the end of the driveway, several feet away from the garage door. Just in case the poor spider is still languishing, stunned, on the concrete. 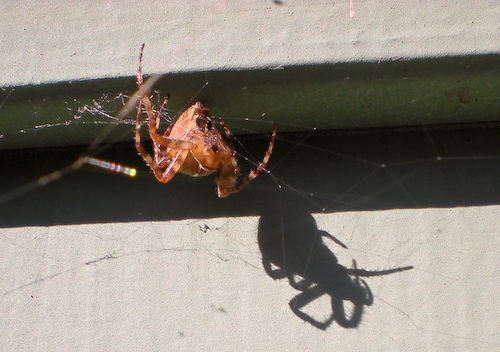 I dash out to see if she’s OK.
She’s on the garage door, sulking under the molding, webs unspun. This, I think to myself, is getting silly. It’s just a spider. She’ll be dead in a couple of weeks anyway. But…”here you go,” I say gently, and edge the car bumper almost to the door, shut off the ignition. She gives no sign that her inconstant rolling foundation is back, but as I watch, she slowly starts to spin. Orb Weaver is the proper name for these and they are completely harmless to you and I. Great story! Gorgeous photo of the spider. And I really, really hate spiders. Hi Cynthia!! Why am I crying? I love your spider, and also ours, and your story is one bright light in the sadness that winter will soon be here. Your spider is the same species as we have here in MD. I memorialized one in a pdv piece as well as a frit casting so I could enjoy seeing her and thinking about her. Over the years our strong females have found many porch, window, and planter bed places to attach to, and then we get to see her catch and wrap her prey (many of them stink bugs…got to watch a couple of times). How simply marvelously special to see these intricate and special events. You captured these gems so well in your prose..the stuff of story books for children (and adults). Only once did I get to see her babies emerge and scatter. Another whole story I hope you get to write. They don’t seem to bite me and I’m always running into them both in and out of the house. Can’t tell you how many times I’ve had to shake spiders outta my hair after forgetting to look before heading in or out between the two out of control boxwoods that they like to stretch webs between. House rules – as long as they’re not on me or in my bath or bed, they’re welcome! Every now and then I do vacuum up the webs though. Well, they’re not allowed IN the garage. Same rules apply there as in the house: Anything with more than four legs stepping over the threshold is automatically sentenced to death row. I’m so glad I didn’t know this about your garage last weekend.